Bronner, D. N. and O’Riordan, M. X. (2016). Measurement of Mitochondrial DNA Release in Response to ER Stress. Bio-protocol 6(12): e1839. DOI: 10.21769/BioProtoc.1839. Mitochondria house the metabolic machinery for cellular ATP production. The mitochondrial network is sensitive to perturbations (e.g., oxidative stress and pathogen invasion) that can alter membrane potential, thereby compromising function. Healthy mitochondria maintain high membrane potential due to oxidative phosphorylation (Ly et al., 2003). Changes in mitochondrial function or calcium levels can cause depolarization, or a sharp decrease in mitochondrial membrane potential (Bernardi, 2013). Mitochondrial depolarization induces opening of the mitochondrial permeability transition pore (MPTP), which allows release of mitochondrial components like reactive oxygen species (mtROS), mitochondrial DNA (mtDNA) or intermembrane space proteins into the cytosol (Martinou and Green, 2001; Tait and Green, 2010; Bronner and O'Riordan, 2014). These contents trigger inflammation, and can lead to cell death (West et al., 2011). Both mtROS and cytosolic mtDNA contribute to the activation of inflammasomes, multiprotein complexes that process the proinflammatory cytokines, IL-18 and IL-1β. Studies indicate that cytosolic mtDNA in particular can bind two different inflammasome sensors, AIM2 and NLRP3, leading to inflammasome activation (Burckstummer et al., 2009; Hornung and Latz, 2010). In this protocol, you will be able to specifically extract cytosolic mtDNA and quantify the amount using a qPCR assay. Seed 1 x 106 cells in 2 ml per well into 6-well plate in the appropriate medium. The following day (~16 h later), aspirate medium and add medium containing thapsigargin (10 µM in 2 ml medium for 4-6 h) (Hornung and Latz, 2010). At relevant times post-treatment (e.g., 2 h, 4 h and 8 h) wash cells with 1x DPBS once then aspirate 1x DPBS. Add 1% NP-40 (100 µl) to each well and scrape cells. Place lysates into prelabeled microcentrifuge tubes and incubate on ice for 15 min (Livak and Schmittgen, 2001). Spin lysates at 13,000 rpm (16,000 x g) for 15 min at 4 °C to pellet the insoluble fraction. Transfer supernatant (the cytosolic fraction) to a new tube and discard the pellet. Use supernatant in the next step to extract cytosolic mitochondrial DNA. Use DNeasy Blood & Tissue Kit to purify mitochondrial DNA from the cytosolic fraction according to the manufacturer’s instructions (Ly et al., 2003). 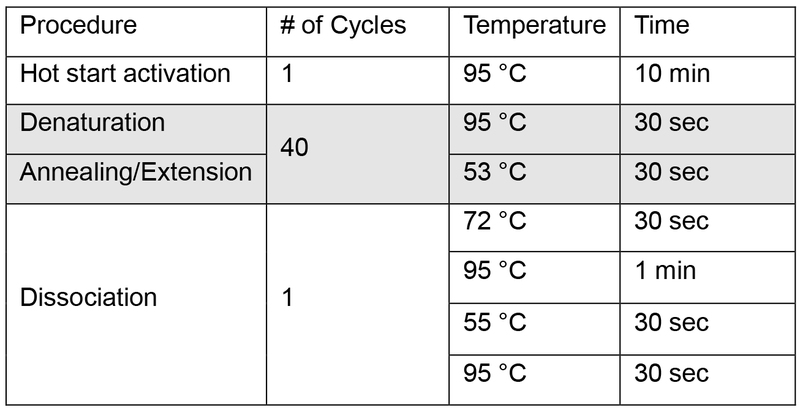 Add 100 µl ethanol (96-100%) to the cytosolic fraction and continue to step 4 in the DNeasy Blood & Tissue Kit protocol. This protocol is optimized for using immortalized bone marrow derived macrophages (iBMDM) (Bronner et al., 2015). Protocol can be optimized for chosen experimental cell type. 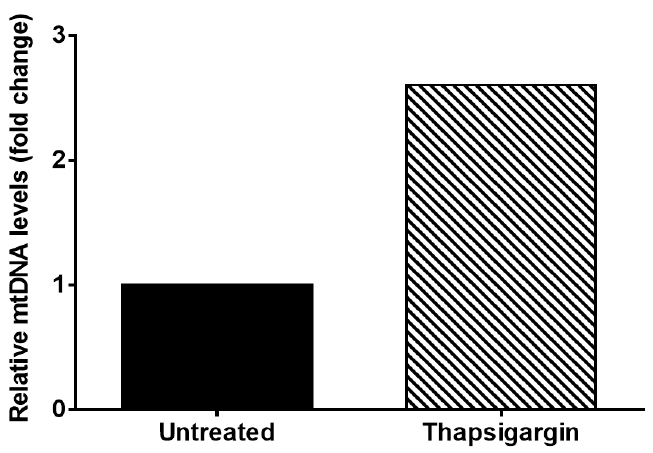 Thapsigargin serves as a positive control for triggering mitochondrial DNA release. Thapsigargin prevents the uptake of calcium into the endoplasmic reticulum (ER) by blocking SERCA channels. Under these conditions, the ER leaks calcium without being able to replenish its calcium stores, and consequently calcium accumulates in the cytosol or mitochondria. Mitochondrial calcium overload triggers depolarization, leading to the release mitochondrial contents into the cytosol. Make a 10% NP-40 stock solution and dilute to 1% NP-40. Use DPBS that contains calcium and magnesium to ensure that cells will remain attached during the wash step. Prelabeled microcentrifuge tubes do not need to be prechilled. 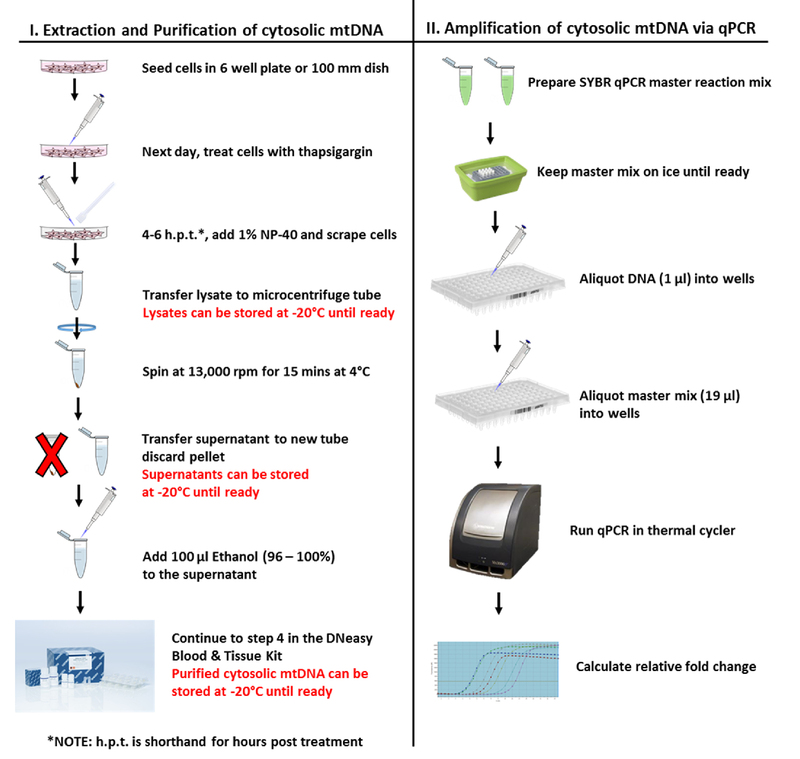 1 x 106 to 1 x 107 (seeded in 100 mm tissue culture dishes) cells will yield 1-20 µg of mtDNA. Add 50 ml heat-inactivated FBS to 450 ml of DMEM. FBS is heat inactivated for 30 min at 55 °C. This medium has been optimized for iBMDM. Use medium optimized for experimental cell type. For 10% NP-40, add 1 ml of NP-40 to 9 ml of dH2O. For 1% NP-40, add 1 ml of 10% NP-40 to 9 ml of dH2O. The concentration stated above has been optimized for iBMDM. The concentration used on different cell types must be optimized. Stock solution of thapsigargin is 5 mM (1 mg in 307 µl DMSO). Dilute thapsigargin (4 µl into 2 ml of medium) into medium that will be added to the wells. After extracting DNA from the cytosolic fraction, quantitative PCR is employed to measure cytosolic mitochondrial DNA. Mix gently but thoroughly by pipetting. Incubate reaction mix on ice until ready to use. Aliquot DNA samples (1 µl) into wells (run in triplicates) (Bronner et al., 2015). Aliquot corresponding Master Mix (19 µl) into the corresponding wells (Bronner and O'Riordan, 2014). Once qPCR is complete, calculate relative fold change in cytochrome c oxidase I from the Ct values. This result indicates that thapsigargin treatment results in a 2.6 fold increase in cytosolic mtDNA compared to untreated (Figure 2). Figure 2. Graph of representative data from Table 3. Graph depicts cytosolic mtDNA relative fold change seen in Thapsigargin treated iBMDM when compared to untreated iBMDM. Use plates that are optimized for qPCR machine. The total reaction volume is 20 µl. When adding DNA ensure the amount is consistent between samples. Pipette as accurately as possible during steps 4 and 5, since small variations in volumes can increase variability in the qPCR results. We acknowledge financial support from the University of Michigan Rackham Graduate School (D. N. B. ), the UM Genetics Training Program (D. N. B., GM007544). This research was supported by funding from the NIH to M. X. D. O. (AI101777). The funders had no role in study design, data collection, and analysis, decision to publish, or preparation of the manuscript. We acknowledge that this protocol was adapted (Nakahira et al., 2011) and modified for use with immortalized bone marrow macrophages infected by a bacterial pathogen. Bernardi, P. (2013). The mitochondrial permeability transition pore: a mystery solved? Front Physiol 4: 95. Bronner, D. N., Abuaita, B. H., Chen, X., Fitzgerald, K. A., Nunez, G., He, Y., Yin, X. M. and O'Riordan, M. X. (2015). Endoplasmic reticulum stress activates the inflammasome via NLRP3- and Caspase-2-driven mitochondrial damage. Immunity 43(3): 451-462. Bronner, D. N. and O'Riordan, M. X. (2014). A near death experience: Shigella manipulates host death machinery to silence innate immunity. EMBO J 33(19): 2137-2139. Burckstummer, T., Baumann, C., Bluml, S., Dixit, E., Durnberger, G., Jahn, H., Planyavsky, M., Bilban, M., Colinge, J., Bennett, K. L. and Superti-Furga, G. (2009). An orthogonal proteomic-genomic screen identifies AIM2 as a cytoplasmic DNA sensor for the inflammasome. Nat Immunol 10(3): 266-272. Hornung, V. and Latz, E. (2010). Intracellular DNA recognition. Nat Rev Immunol 10(2): 123-130. Livak, K. J. and Schmittgen, T. D. (2001). Analysis of relative gene expression data using real-time quantitative PCR and the 2(-Delta Delta C(T)) Method. Methods 25(4): 402-408. Ly, J. D., Grubb, D. R. and Lawen, A. (2003). The mitochondrial membrane potential (deltapsi(m)) in apoptosis; an update. Apoptosis 8(2): 115-128. Martinou, J. C. and Green, D. R. (2001). Breaking the mitochondrial barrier. Nat Rev Mol Cell Biol 2(1): 63-67. Nakahira, K., Haspel, J. A., Rathinam, V. A., Lee, S. J., Dolinay, T., Lam, H. C., Englert, J. A., Rabinovitch, M., Cernadas, M., Kim, H. P., Fitzgerald, K. A., Ryter, S. W. and Choi, A. M. (2011). Autophagy proteins regulate innate immune responses by inhibiting the release of mitochondrial DNA mediated by the NALP3 inflammasome. Nat Immunol 12(3): 222-230. Tait, S. W. and Green, D. R. (2010). Mitochondria and cell death: outer membrane permeabilization and beyond. Nat Rev Mol Cell Biol 11(9): 621-632. West, A. P., Shadel, G. S. and Ghosh, S. (2011). Mitochondria in innate immune responses. Nat Rev Immunol 11(6): 389-402. How to cite: Bronner, D. N. and O’Riordan, M. X. (2016). Measurement of Mitochondrial DNA Release in Response to ER Stress. Bio-protocol 6(12): e1839. DOI: 10.21769/BioProtoc.1839.